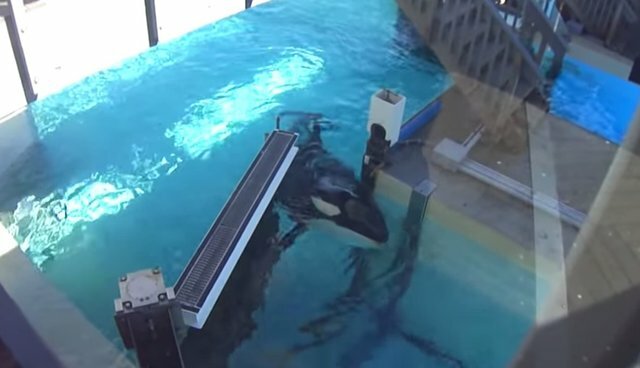 A video showing a pregnant orca named Kalia stuck in a metal gate at SeaWorld has captured the attention of animal activists - and SeaWorld. The footage, filmed by a visitor to the park, was taken at SeaWorld San Diego in California. At about minute 2:00 in the footage, Kalia is seen caught between the metal bar of the gate and the wall as the gate closes on her. While another whale named Ulises hovers around, she stays in the gate for a full minute until it finally opens at about 3:00. Kalia, a nine-year-old captive-born female, is pregnant with her first calf and due in December. As Cetacean News Network pointed out, this incident isn't the first of its kind. In fact, the genetic "grandfather" of Kalia, a wild-caught male named Kotar, reportedly died when he was just 17 years old at SeaWorld San Antonio while he was playing with a gate in 1995. The gate closed on his head, causing a fracture and severe blood loss. The gates at Shamu Stadium use a small amount of pressure, and open and close slowly. The whales can easily move them when the trainers begin a gate cycle. Gate play is an enjoyable game for the whales. When a whale is playing with a gate, the trainers are always nearby. Check out some of the killer whale trainers discussing gate play. The company also produced a video showing animal care trainers at the park watching the footage and explaining that Kalia was "playing." SeaWorld has been feeling the pressure from animal activists after the release of "Blackfish." In the wake of allegations of inbreeding, poor animal care and several violations of the Animal Welfare Act, the company has taken to YouTube to defend itself. Videos with titles like "Why We Shouldn't Close Zoos and Aquariums," and "Blackfish isn't unbiased. It's one-sided" have cropped up recently. Meanwhile, efforts to stop SeaWorld from keeping orca whales in captivity are gaining momentum. In March, a groundbreaking bill was introduced to ban captive orca shows in California. And in May, 38 members of Congress penned a scathing letter calling for better regulations considering captive whales. They cited "Blackfish" as their motivation.